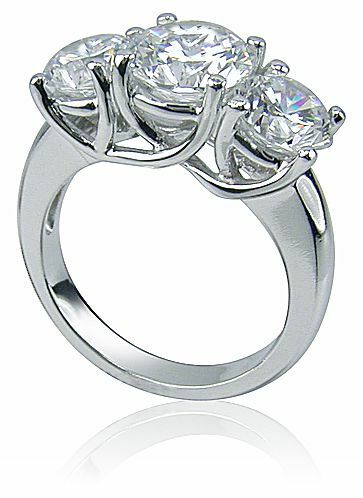 Three Stone Round Cubic Zirconia Luccia Criss Cross Trellis Anniversary Ring features a 2 carat 8mm round center cubic zirconia and a 1 carat 6.5mm round cz on each side. 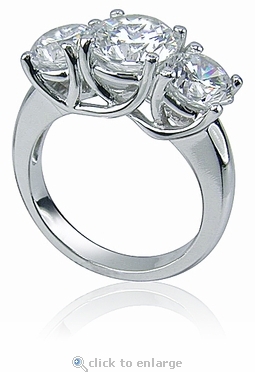 This three stone style anniversary ring has been a classic design that has continued to stay popular with its unique criss cross or trellis style prongs the beautifully secure all three cubic zirconia round stones. A solid gold mounting coupled with original Russian Formula cubic zirconia stones that are hand cut and hand polished provide a superbly crafted finished ring that will rival any other fine diamond jeweler in quality and in price. The ring has a total carat weight of 4 carats. This ring is impressive and a bargain at this price. Due to extremely low pricing, all clearance sales are final.